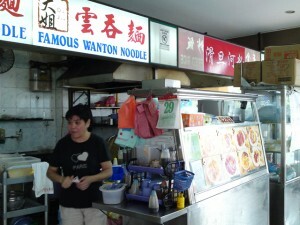 Home / Chinese Cuisine / Da Jie Famous Wanton Mee – Not Only Famous But Cheap And Good! Although you need to have a good $3 in your pocket to enjoy a decent meal nowadays, there are some stalls that insist on selling you a meal for $2. Infact some of these stalls are dishing out foods that are pretty good. Stalls like Tong Xing Roasted, Sungei Road Laksa or Hai Kee Roasted Specialist sell foods at $2 with quality that are well qualified to be sold at $3-$4. 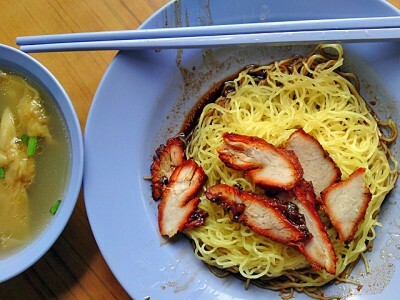 In Singapore, Wanton Mee is a general term for dry noodles mixed with some sauce and Char Siew whereas in Hong Kong, Wanton Mee is really wanton and mee only and it is served in the soup. If people were to ask me where was my favourite wanton mee place in Singapore, I would have to say Crystal Jade. Ok I know the price is quite steep at around $7+ but the noodles’ texture is seriously quite unique for me and even without good sauce, I always gobbled it down effortlessly. There are many ways to judge a plate of Wanton Mee but if it is good, usually it is the sauce that did the trick and things like the noodles’ texture or the soup are often overlooked. Kok Kee is one example, the noodles, char siew, wanton, the soup and even the chili sauce are just so so but the sauce makes it a winner. 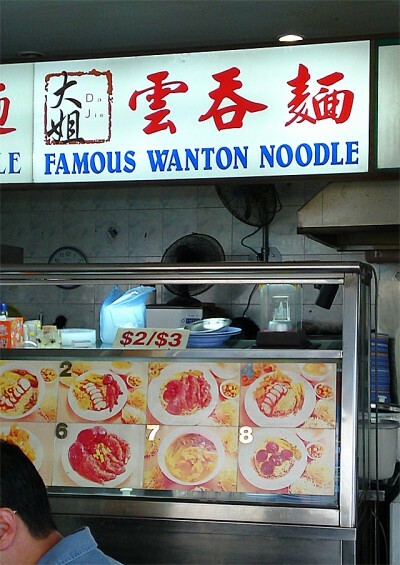 Loudly proclaimed on the signboard of Da Jie Wanton Mee as being one of the more famous Wanton Mee stalls around, I was a bit skeptical when I saw badly printed photos of Wanton Mee pasted all over and as if that’s not enough of a tell tales sign of a lousy wanton mee stall, it is only selling at $2 for a plate. For some reasons, most customers there were having the soup Wanton Mee but I still prefer my Wanton Mee in dry form so I went for it. For $2, the amount of char siew on top of my noodles was seriously quite generous. 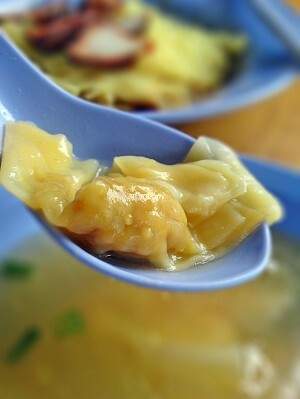 As if that is not enough to score for value, there were 3 wantons in the soup which was not too bad. The fillings are pretty unique with a little bit of kiam her(salted fish) flavour in the minced pork. Now I can understand why most people ordered the soup version. The soup is very very tasty. 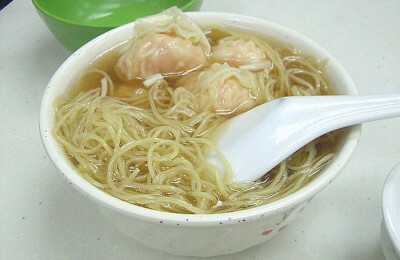 It is seriously unique with a strong hint of sweetness and really resembles one of those Hong Kong Wanton Mee’s soup. It is the best Wanton Mee soup for all that I’ve eaten, even Crystal Jade loses out. The char siew was quite normal but have enough charred edges to perform reasonably well. What blew me away was the noodles which had texture that’s equivalent to Crystal Jade’s standard! I have always loved the kind of noodles that have the QQness that is so al dente, thin and chewy. 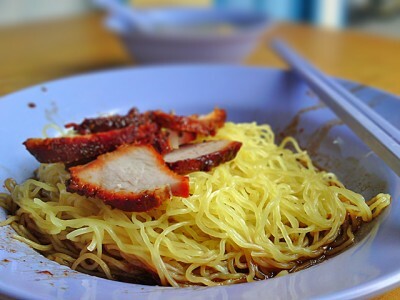 This type of noodle is very commonly found in Hong Kong but only can be found in cantonese restaurants in Singapore. Da Jie wanton Mee is the first stall I’ve come across that uses this kind of noodles. It had very very good bite and is a clear winner for all that I’ve eaten. The sauce was also quite delicious with a lot of sweetness which makes it more of cantonese version. This will be a place for my Wanton Mee fix very often. For $2, there is simply no horse run. For value, taste and authenticty, this scores very highly. The good thing for me is I do not need to visit Crystal Jade for that special QQ wanton noodles anymore. Very surprised to find an extremely high quality of Wanton Mee here for $2. The $3 version will get you a few fried dumplings. I am eager to return to try out the soup version. Conclusion: For noodles and soup, undoubtedly the best I have eaten in the $2 bracket. Noodles was shiokadodoly QQ. Very nice to bite with a unique chewiness. Soup has a hint of sweetness and very very pang. Almost perfect for me, if they can use a bit of gao wong, would be even better! 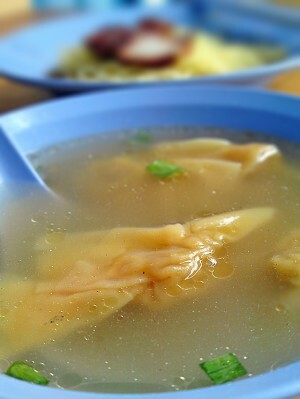 I would pay for this bowl of Wanton Mee even if it were to be sold at $10 at any restaurant. It is really that good. You gotta try it to know. Likes: Soup is seriously shiok. Noodles is seriously QQ. Dislikes: The wanton skin is a little too thick. This is more of a traditional KL type of wanton mee. This is the best of the best. Prefer the soup version also. Try the chicken feed, its very good also. Why do you call it KL version? Thanks, will get the chicken feet next time! It’s a very good wanton noodles,you can side order the chicken feet if you want.